Thanks to Allwinner, a Chinese ARM system-on-a-chip maker, which has recently been caught shipping a version of Linux Kernel with an incredibly simple and easy-to-use built-in backdoor. Chinese fabless semiconductor company Allwinner is a leading supplier of application processors that are used in many low-cost Android tablets, ARM-based PCs, set-top boxes, and other electronic devices worldwide. Send the text "rootmydevice" to any undocumented debugging process. 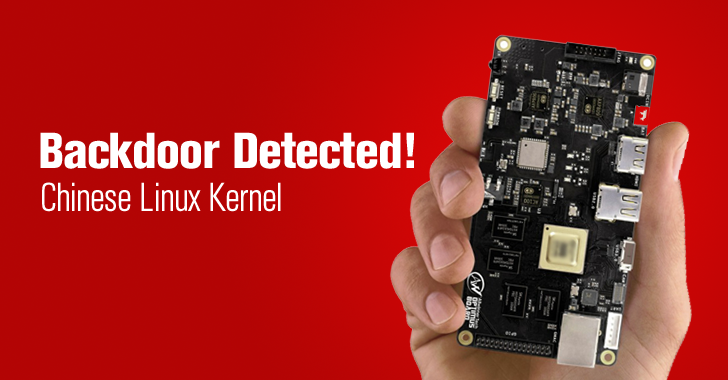 The local privileges escalation backdoor code for debugging ARM-powered Android devices managed to make its way in shipped firmware after firmware makers wrote their own kernel code underneath a custom Android build for their devices, though the mainstream kernel source is unaffected. The backdoor code is believed to have been left by mistake by the authors after completing the debugging process. The Linux 3.4-sunxi kernel was originally designed to support the Android operating system on Allwinner ARM for tablets, but later it was used to port Linux to many Allwinner processors on boards like Banana Pi micro-PCs, Orange Pi, and other devices. At the forum of the Armbian operating system, a moderator who goes by the name Tkaiser noted that the backdoor code could remotely be exploitable "if combined with networked services that might allow access to /proc." This security hole is currently present in every operating system image for A83T, H3 or H8 devices that rely on kernel 3.4, he added. This blunder made by the company has been frustrating to many developers. Allwinner has also been less transparent about the backdoor code. David Manouchehri released the information about the backdoor through its own Github account (Pastebin) and then apparently deleted it.